Myth also states that Holi is the celebration of death of Ogress Pootana who tried to kill infant, Krishna by feeding poisonous milk to it. The riot of Colors..the most colorful festival of Holi is on the 27th of March. The sight of Holi is so beautiful to watch; as the entire atmosphere gets filled with the clouds of colours…And, as if to match with the cheerful mood of the …people nature itself wears its best and most colourful clothes. The energy of the people as they move out in groups, playing dholaks, singing songs in their highest possible pitch; completly drenched in colours but more so in the spirit of Holi – throwing gulal and abeer in the air and on the feet of their elders as a mark of respect- it is this spirit of the festival that makes it so delightful and memorable. 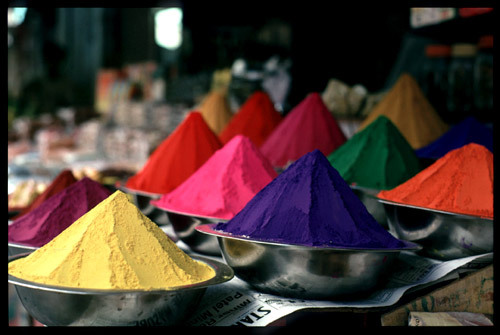 The legend from which the tradition of playing colours started is full of colours in itself. The story goes that the very colourful Indian god, Lord Krishna was jealous of his soul mate Radha’s fair complexion, since he himself was very dark. 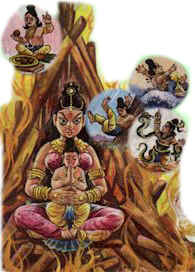 Naughty young Krishna complained to his mother Yashoda about this injustice of nature. To placate the child, doting mother asked Krishna to apply colour on Radha’s face and change her complexion according to his choice. Playful and mischievous Krishna appreciated the idea and implemented it. The game of applying colours thus gained so much popularity that it became a tradition and later it turned out to be a full fledged festival. Till date, lovers desired to colour and be coloured by their mates. The application of colours has in a way become an expression of love. Tomorrow we shall know more about holi and the Myth behind this festival.. The Savithri Vratham is observed on the day that the Tamil month of Maasi changes to Panguni, usually around March 15. Savithri among the five Satis projects the image of a loyal and steadfast wife who could bring back her husband from Yama the God of Death because of her intrepidity and thinking-on-her-feet capacities. The childless king of Madra, Ashwapati, lived as an ascetic for many years and prayed to the Sun God Savitr for an heir. His prayers were answered and God Savitr granted him a boon of a daughter. The king named her Savitri and as she had been born out of devotion, piety and asceticism became her qualities later in life. Savitri was so beautiful and pure that she intimidated men. When she reached marriageable age, no man asked for her hand. So her father told her to find a husband on her own. She set out on a pilgrimage and found Satyavan, the son of an exiled, penniless, blind king named Dyumatsena who was a forest-dweller. However, Satyavan was destined to die one year from the day of her marriage. An adamant Savitri married Satyavan and went off to the forest and lived as an obedient and respectful woman to her new parents-in-law and husband. Three days before the predicted death of Satyavan, Savitri began to observe a fast and vigil. 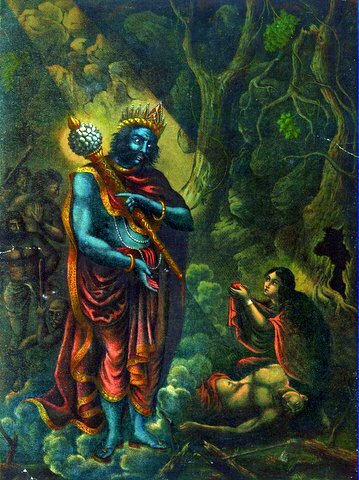 On the morning of Satyavan’s final day, Savitri accompanied her husband into the forest where Yama, the God of Death, came to claim the soul of Satyavan. Savitri followed Yama as he carried the soul away. When he tried to convince her to go back, she offered various wise arguments. Savitri praised Yama for his just rule as King of Dharma, and for his noble conduct with no expectation of return. Impressed by her oratorical skills Yama offered her any boon, except the life of Satyavan. She first asked for the eyesight of her father-in-law and restoration of his kingdom. Next her wish was for a hundred sons for her father and then a hundred sons for herself and Satyavan. The last wish cleverly created a dilemma for Yama, as it would indirectly grant the life of Satyavan. However, impressed by Savitri’s dedication and purity, he offered her any boon. Savitri instantly asked for Satyavan to return to life. Yama granted life to Satyavan and blessed Savitri’s life with eternal happiness. From then Savitri has always been idolized as the ideal woman who used her wits to win back the life and riches of her husband. It is believed that Savithri got her husband back on the first day of Tamil month “Panguni“. So, this day is celebrated as “Karadayan Nonbu” in Tamil Nadu. On this day, married women and young girls wear yellow robes/thread and pray to Hindu goddesses for long lives for their husbands. Girls start this practice very young; they wear a yellow robe/thread on this day from the time they are just one year old so they will find a good husband in the future. Om Namah Shivaya is the potent mantra (prayer or chant) that is also called Panchakshara Mantra, the five sacred syllables. The mantra can be split into five syllables: na-mah-shi-va-ya. When the ‘Om’ is included, it is re…ferred to as the six syllable mantra. There are many deep meanings assigned to this mantra. Paanch means five and represents the five elements of earth, water, fire, air, and space. This is the primordial sound that was the beginning of creation. • Om has three different reverberating sound elements (A-U-M) that arises from the stomach, then lungs and finally the mouth and closed lips and stand for:. • The states of waking, dreaming, deep sleep. • States of gross, subtle and causal elements. • The levels of conscious, unconscious and subconscious states of being. • The three universal processes of birth, being, and death. This means bowing or paying homage, respect to Eswara, the divine. Siva is Absolute Reality, representing the static state or ground, the base from which all else emerges. Shakti, is half of Shiva and represents the dynamic and active or creative aspect of life. Shiva and Shakthi are the same, just two aspects of creation and destruction. Om Namah Shivaya means at its most simple level, “I bow to Shiva.” Shiva is the supreme reality, the inner Self, the consciousness that dwells in all of us. If ‘Om Namah Shivaya’ vibrates non-stop in your heart, then it is believed that you need not perform austerities, rituals and practices associated with Hindu way of life. Usually, a teacher or Guru initiates you into a particular mantra or worship of a deity. To repeat the mantra ‘Om Namah Shivaya’ you need no initiation and anybody can chant this at an anytime, anywhere. 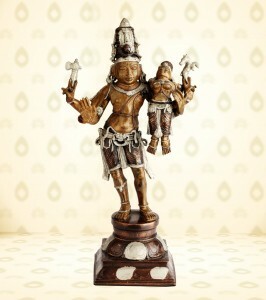 Shiva is the Cosmic Dancer, source of both good and evil. He is considered to be an amalgam of all three aspects of creation: creator, preserver and destroyer. He can be pleased easily with devotion and many of the problems… created on earth by wicked men result from his generous boons. Vishnu then takes a hand in eradicating evil. 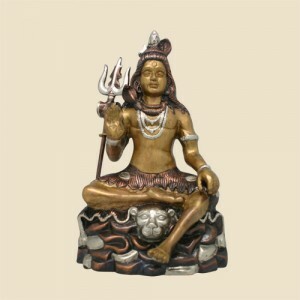 Shiva is considered to be the destroyer of the Universe. He also symbolises the inner self that is eternal, indestructible and remains intact even after everything ends. Shiva the destroyer is a necessary part of the Trinity because, without destruction, there can be no recreation. He helps to maintain the balance and the cycle of birth, life and death. Siva’s city is Kasi (Varanasi or Benares) and Hindu’s believe that if they die or their last rites are performed in Kasi, their souls will achieve eternal salvation. In Shiva, opposites meet. Shiva is the source of both good and evil who combines many contradictory elements. Shiva is blend of the masculine and feminine aspects of nature and creation. In pictures and sculptures, Shiva is represented as Lord of the Dance who controls the movement of the universe. He is also associated with fertility and is a family man. Shiva’s consort, his Ardhangini or half takes many incarnations as well. She is Sati, the loyal and chaste wife, she is Kali, the destroyer of evil who is often shown wild and fearsome. Parvati is the epitome of gentleness and the mother of Shiva’s two sons Ganesha and Kartikeya (Subrahmania or Muruga). Durga is the representation of Shakthi, a powerful goddess created from the best aspects of several gods.